The schedule is a great tool for both avoiding and supporting claims. When jobs fall behind, the parties need to sort out the various causes of delay to determine if the contractor is entitled to a time extension, will need to accelerate, or will be on the hook for liquidated damages. These two very important on-demand training sessions presented by construction scheduling experts and consultants are for anyone who needs to submit or review a schedule update, or is involved in sorting through the various issues of concurrency in assessing project delays. Construction delays can have significant impact on the cost of performance for both the contractor and owner. Who ultimately pays for these delays is highly dependent upon a forensic schedule analysis to determine both responsibility and duration of each delay encountered. 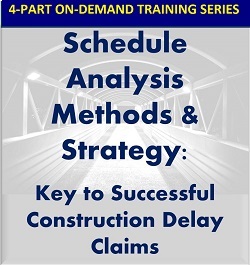 Listen in on this 4-part series presented by today’s leading experts on the subject to learn what you should be doing if anticipating a claim on an existing project or are already involved in developing or negotiating a delay claim. Gain control of schedule delay strategy and methods today! Attorney Jeff Gilmore and consultant Tom Fertitta cover the topic from A-Z, including typical causes, types and outcomes of most delay situations. Join Jeff and Tom to get dialed into the intricacies of delay presentations, support, analysis and defense. Attorneys Mike Harris and Brian Dugdale team up to explain the often-overlooked concept of mitigating delays, which the contractor is obligated to do notwithstanding the causes. The fine line between mitigating and acceleration is explained, along with the various types of acceleration, plus the necessary documentation and proof to support and price an acceleration claim. 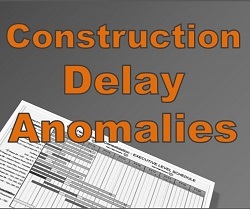 There are two approaches for measuring delay, though identified separately in the construction claims literature, are entirely compatible and, when combined, provide a comprehensive, project-schedule-based approach to quantifying delays. Listen to this information-packed session to learn how and when to use each type of delay analysis. Contract language supporting these methods will be reviewed and discussed. 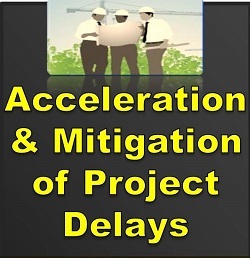 The presentation also addresses the practical impact of a pacing delay, both to the project as well as to a contractor's delay claim. 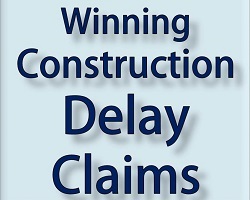 Thus, owners and contractors often find themselves at odds with one another over the right to pacing delay and the practical effect of pacing delays in delay claim situations. This webinar is intended to provide a better understanding of pacing delays and how they ought to be handled. 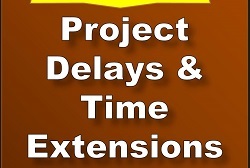 A basic skill of construction professionals is the ability to prepare and evaluate time extension claims. Or at least it should be. 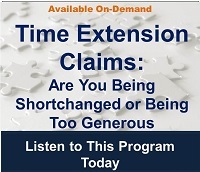 All extension claims have to address the same basic concerns – cause, effect, responsibility and cost. The focus of this webinar is on “effect” and “cost.” The “effect” is the quantification of the delay and the “cost” is the expenditure attributable to the delay.